Ukraine and Azerbaijan are preparing to create a joint venture. Ukraine will soon unveil a preliminary program and structure of organization, planning, construction and maintenance of a company that will assemble Ukrainian An-178 in the territory of Azerbaijan, the Cabinet reported on 1 July on its website. The agreement was reached on 1 July at the 11th session of the intergovernmental Ukrainian-Azerbaijani commission for economic cooperation. Earlier, agreements were reached between CJSC Azerbaijan Airlines and the State Enterprise Antonov on the production of Ukrainian aircraft An-178 in Azerbaijan. The design capacity of the assembly plant is at 12-15 aircraft a year. On 7 June, Azerbaijan expressed interest in launching the assembly of modern Ukrainian aircraft An-178 on its territory. Last May, Antonov and the Azerbaijani Silk Way Airlines signed a deal on the supply of ten AN-178s. The first two aircraft, under the terms of the contract, shall be delivered by the end of 2018, the remaining eight aircrafts - as agreed. Azerbaijan hopes that by mid-2018, when the first aircraft is delivered, industrial capacities for the assembly of An-178 will be built on the Azeri territory. The president of Antonov Mykhailo Gvozdev, in the meantime, stressed that the cooperation program does not envisage the sale of An-178 technologies to Azerbaijan. The plant on the territory of Azerbaijan will do only the final assembly of the aircraft. 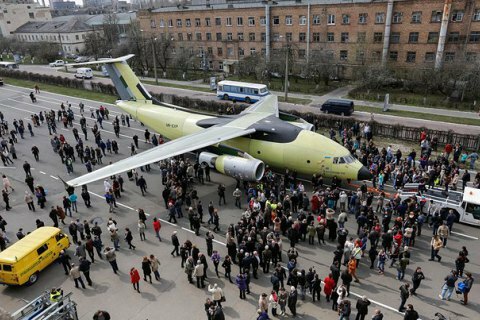 An-178 did its maiden flight on 7 May, 2015. It is designed to perform all the basic tasks of transport aircraft, including - logistics, parachute landing of cargo platforms, transportation of patients, equipment and engines. The construction of the first An-178 began in 2013. It was conceived as a replacement for the outdated models of Antonov. An-178 is based on the recently launched passenger aircraft An-158.